Chinese authorities have recovered one of the country's most precious relics. Ma Lie reports from Xi'an. When Han Qinglong saw for the first time the reconstructed sarcophagus of Wu Huifei, a royal concubine during the Tang Dynasty (AD 618-907), it took his breath away. and sold abroad by tomb raiders. "It looks so grand," he said. "I feel proud that we managed to find our lost treasure." The 27-ton sarcophagus, which is decorated with colorful flowers and maiden figures in relief, went on display at the Shaanxi History Museum on June 17 and is the first State-level relic that Xi'an police have recovered from a foreign country through legal processes. Tan Ping, director of museums and cultural relics for the State Administration of Cultural Heritage, described the return of the treasure as "encouraging news". According to official archives, China has retrieved almost 4,000 antiques through legal and diplomatic means since 1998. The sarcophagus arrived back in Xi'an, capital of Shaanxi province, in April and experts took almost a month to reassemble the ancient stone relic, which was dismantled by the tomb raiders before it was shipped abroad. 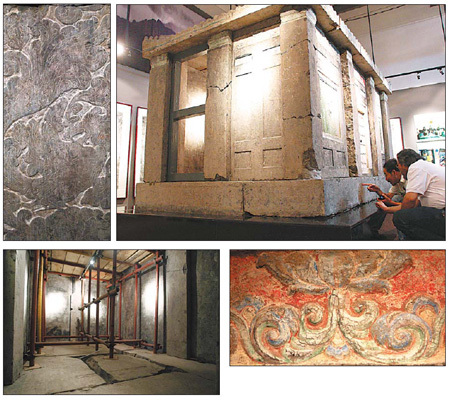 "It was difficult as there was no complete information about the sarcophagus available to help us," said Shi Xiaoqun, director of relics collection at Shaanxi History Museum. 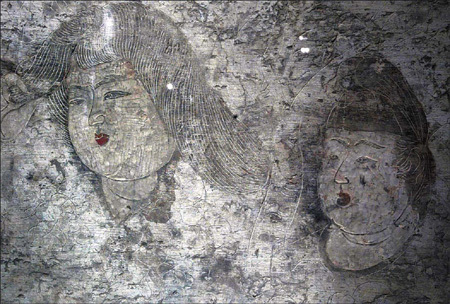 The priceless treasure was stolen from a Tang Dynasty tomb in Xi'an in 2005 by a gang of grave robbers led by Yang Bin and sold to an antiques dealer in the United States. Securing its return took city representatives months of negotiations - and even the threat of legal action. Clockwise from top left: Some of the colorful flower images carved into the sarcophagus; Archaeologists scrutinize the carvings; The relic has retained its bright colors; Scaffolding used to fix the sarcophagus. Police in Xi'an began their investigation into the theft in January 2006 after receiving an anonymous tip-off. From the information given, detectives learned Yang had invaded Jingling Mausoleum (which archaeologists had yet to excavate) in the city's southern suburbs, stolen a sarcophagus and sold it overseas for $1 million. What they did not know at the time was whose remains were in the sarcophagus. Tombs belonging to Tang Dynasty emperors and their family members, as well as high-ranking officials, are scattered across Xi'an, which used to be called Chang'an and was the capital city. "We launched a large-scale investigation and interviewed villagers living around the ancient tombs in Chang'an district (to get more details)," recalled Cao Nanhua, deputy director of Xi'an public security bureau's criminal investigation office. "We also had people watching the tombs around the clock." The surveillance paid off and in February 2006, six people were arrested digging in one of the tombs. "We checked the home of one of the suspected - Shi Yong'an - and found more than 100 cultural relics, as well as a gun and some 200 detonators," said Cao. Officers also seized a computer containing a number of photos of the sarcophagus that Shi Yong'an insisted belonged to gang boss Yang, a struggling photographer. Police say Yang quit his job with the State-owned Xi'an Film Studio for tomb raiding in the early 1990s after an accidental meeting with traffickers. "We tracked down an illegal repair shop run by Yang, where he worked on the stolen relics," said Han, who runs the heritage investigation team at Xi'an public security bureau. Yang was eventually caught about 1,800 kilometers away on July 14 in Shenzhen, Guangdong province. He had been planning to escape to Hong Kong but ran out of money. Under interrogation, Yang admitted breaking into Jingling Mausoleum in March 2004 and taking pictures of the sarcophagus to show antique dealers. His gang then raided the tomb six times between June 2004 and May 2005, plundering most of the relics inside. "The gang broke the sarcophagus into pieces and packed it in several boxes before sending it to Guangzhou (capital of Guangdong) and selling it overseas," said Han. Yang was sentenced to death with a two-year reprieve at Xi'an Intermediate People's Court in August 2007, while the rest of the grave robbers were given prison terms of between seven years and life. Ironically, the pictures Yang originally took of Wu's sarcophagus on the computer seized by police not only helped his prosecutors, but also proved invaluable to the experts charged with identifying and reassembling the relic. "After sending the gang to prison, we stepped up efforts to find where the stone relic went," said Han. "We sent information about the case to the Ministry of Public Security and Interpol." Archaeologists excavated Jingling Mausoleum between September 2008 and May last year. "We found a tunnel 18.5 meters long and 2.45 meters wide, with seven patios," said Shi Xiaoqun at Shaanxi History Museum. "There were plenty of colorful murals on the walls of the corridor and tomb room, pictures of guards of honor, acrobatics, gardens with trees, birds and flowers. "It was obviously a royal tomb and we would have found many more relics if they had not been robbed," he said, adding that records found after the excavation proved it belonged to Wu. In July last year, police in Xi'an received a tip-off that the sarcophagus was in the United States. Within months Han and his team flew to Hong Kong to start negotiations with "a man name Mike", who was representing the US antiques dealer who bought the relic. "We told him that the sarcophagus was a rare Chinese relic that was smuggled overseas and that the antiques dealer should return it," said Han. "We warned that we would seek help from Interpol if necessary." After two more rounds of talks, which this time involved Xi'an's public security officials and experts from Shaanxi History Museum, the buyers agreed to return the sarcophagus to China. After arriving at Guangzhou port on April 17, Wu Huifei was back in Xi'an by the end of the month. "This relic provides real information that will help with the study of the mausoleums, customs and arts from the Tang Dynasty," said Feng Gengwu, Party secretary for Shaanxi History Museum.